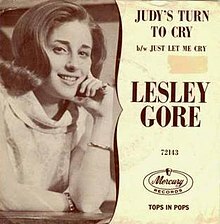 (1963) "Judy's Turn to Cry"
Subsequent to initial release as a single and on I'll Cry If I Want To, "Judy's Turn to Cry" has been released on numerous Lesley Gore compilation albums. These include The Golden Hits of Lesley Gore in 1965, It's My Party: The Mercury Anthology in 1996, Sunshine, Lollipops, and Rainbows: The Best of Lesley Gore in 1998, 20th Century Masters – The Millennium Collection in 2000 and The Ultimate Collection 1963–1968: Start the Party Again in 2005. It has also been included on a number of multi-artist compilations of 1960s songs. ^ Larkin, C. (1998). The Virgin Encyclopedia of Fifties Music. Virgin. p. 315. ^ a b c d e f Viglione, J. "Judy's Turn to Cry". Allmusic. Retrieved July 19, 2011. ^ "Lesley Gore Charts and Awards". Allmusic. Retrieved July 19, 2011. ^ Studwell, W.E. ; Lonergan, D. (1999). The classic rock and roll reader: rock music from its beginnings to the mid-1970s. Psychology Press. p. 252. ISBN 978-0-7890-0151-1. ^ Larkin, C. (1995). The Guinness encyclopedia of popular music, Volume 3 (2 ed.). University of California. p. 1705. ISBN 978-1-56159-176-3. ^ a b Goldmine Magazine (1999). Goldmine roots of rock digest. Krause Publications. p. 183. ISBN 978-0-87341-775-4. ^ a b Dean, M. (2003). Rock 'n' roll: Gold rush : a singles un-encyclopedia. Algora Publishing. p. 189. ISBN 978-0-87586-207-1. ^ Ankeny, J. "It's My Party". Allmusic. Retrieved July 20, 2011. ^ Taylor, T.L. ; Crain, M.B. (1999). Angel Courage: 365 Meditations and Insights to Get Us Through Hard Times. HarperCollins. p. 2. ISBN 978-0-06-251583-4. ^ Unterberger, R. "I'll Cry If I Want to". allmusic. Retrieved July 19, 2011. ^ "Girls Girls Girls: 1960's Rock N Roll". Allmusic. Retrieved July 19, 2011. ^ Roxon, L. (1974). Rock Encyclopedia. University of Michigan. p. 207. ^ Milliken, R. (2010). Mother of Rock: The Lillion Roxon Story (2 ed.). Black, Inc. p. 274. ISBN 978-1-4587-8017-1. ^ a b "Judy's Turn to Cry". Allmusic. Retrieved July 19, 2011. "I Don't Wanna Be a Loser"
This page was last edited on 24 December 2018, at 17:32 (UTC).